The 23rd Annual Toronto International Dragon Boat Race Festival is a two-day fun-filled event that brings sports, team spirit and community spirit to Toronto Centre Island on June 25 and 26, 2011. 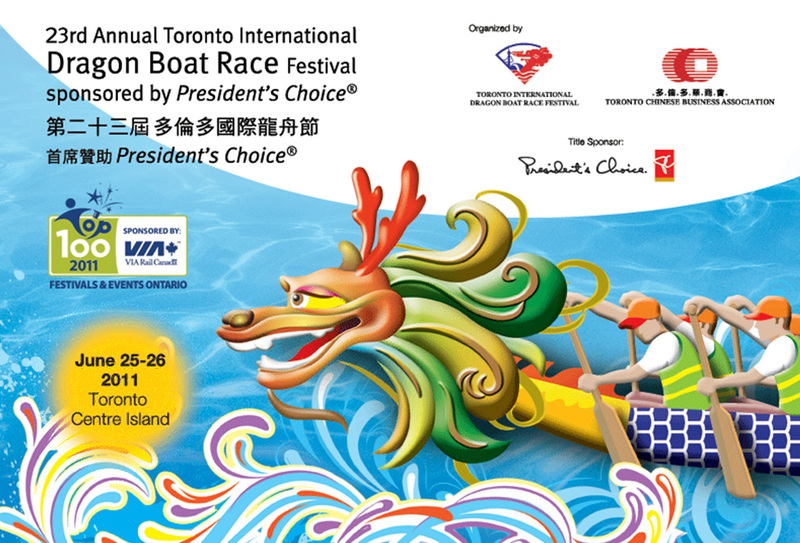 The event is organized by the Toronto Chinese Business Association and Toronto International Dragon Boat Race Festival. This year, they are expecting 180 to 200 teams with over 5,000 athletes. These teams comes from all provinces across Canada, from the U.S., the Caribbean Islands, Europe and Asia. The festival is not only promoting sport and team spirit, but it also values hertiage values social responsibilities. For more information, make sure to check out their Offical Website. I got to the Ferry around 11:45AM on Saturday. It was super packed with people. Lines didn't move quickly while I see the line up for advance purchasing have zero line up. I regret not getting tickets online! Our Ferry hits harbour and people start to go REALLY close to each other to get on. An old lady actually fell =( because some other lady with a stroller hit her by accident. I wanted to try this but the line up was kind of long and I had to go catch my best friend's team race!! I wanted to catch my other friends from Mon Sheong Foundation but I had to leave for work. There were seriously all kinds of people there. And by that, I mean I even saw my elementary school teachers. President's Choice was having an ice cream booth for a free scope. It's generally trying their new flavours! Of course there were other activities too. There were preformances like hertiage dances, dragon dance and more food. The spirit there is awesome, I had so much fun watching people scream and cheer on their teams! I really want to join dragonboat next year too!